After that, I had it easy... That's what I said. They took care of me fine. They trained me to use these things. I can dial telephones, I can drive a car, I can even put nickels in the jukebox. I'm all right, but... well, you see, I've got a girl. These are the best years of our lives, and we're wasting them! 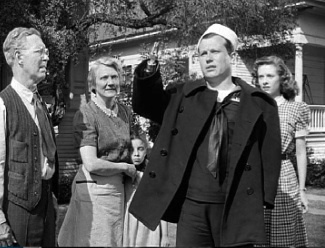 The Best Years of Our Lives was a 1946 film directed by William Wyler and starring Frederic March and Harold Russell. It won seven Academy Awards, including Best Picture of the Year. This movie was one of the first movies that showed war as it was (probably the reason it was so well received), instead of romanticizing it like movies and books were prone to. Bittersweet Ending: The three war veterans are slowly returning to normal lives, with Homer marrying Wilma, and Fred getting divorced from his unloving wife freeing him to court Al's college-age daughter. But all three acknowledge they still have tough roads ahead of them. Girl Next Door: Literally with Homer's girlfriend Wilma. Oscar Bait: Arguably one of the first films to qualify for this. Crowning Moment of Heartwarming: Homer is hugged by his girlfriend Wilma. And he hugs her back. Playing Gertrude: Actress Myrna Loy (Milly Stephenson) was only 13 years older than Teresa Wright who played her daughter Peggy. Shell-Shocked Veteran: Though they all have traits of this, one of the original plans before they found the man who played Homer was to have a full-on Shell Shock victim who constantly had panic attacks. Al can no longer relate to his wife or his children who grew up without him, and is turning into an alcoholic. Fred dismisses the war medals he's earned, and finds himself climbing into the remains of a bomber plane that are getting taken apart now that the war's over. Homer is ashamed of his artificial hooks and can't keep himself around his family or his girl-next-door sweetheart. War Is Hell: We don't see any battles on the screen. All we see is the damage each war veteran brings back with him. World War II: Or, at least, the psychological effects of it. Written in Infirmity: Homer was supposed to be merely shell-shocked, but when real-life amputee Harold Russell was cast, his disability was written in. This page was last edited on 20 November 2017, at 18:20.